FEBRUARY 2008 -- “THE GRANGE IS…a family fraternity with a special emphasis in service to community, especially our most valuable resource, children. Organized in our nations capitol in 1867, Grangers ever believe in the importance of the legislative process, agriculture and the sanctity of God and country.” This 3rd place winner in our Essay Contest was written by Sue Gray from Ekonk Community Grange #89. What does it look like on your street after a snowstorm? Do birds flock to your bird feeder? Are you going somewhere warm for a couple of weeks this winter? 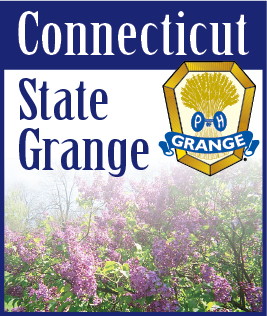 Get your camera out – take a few pictures – and enter next years State Grange Photo Contest. The contest will be held at Good Will Grange Hall in Glastonbury on July 26th. We had a great response to this contest in 2007, but let’s have an even better one in 2008. For full details, see your Lecturer, or you can contact me and I will be glad to send you a complete set of rules. Spring seems like a long way off, but now is the time to start thinking about our “A Number” and Talent Contests. Don’t wait until the last minute. Be prepared! Lecturers cannot do the job alone. They need suggestions and help from everyone in the Grange. The best way to do things is with a united group of dedicated Grangers. The New England Lecturers Conference is no more. This will be the first year for the new Northeast Lecturers Conference. All of us in New England welcome New York. And they are stepping right up doing a program this year. They have already chosen their color - Pink. Thus they will be presenting a program on the Color Pink. The conference this year will be held at the University of Maine — Farmington from August 4 through the 7th. I realize that Farmington is further north than we have gone in recent years, but by going there we were able to keep the pricing the same as last year. So, start making your plans now for the new, bigger and better conference. Make new friends and renew old acquaintances. Connecticut’s program will be Wednesday morning. I am still looking for program numbers which feature the color orange. This may well prove to be one of the hardest programs I have ever attempted and look to you all for your help.